The final Law is the one that is actually the result of doing the previous 3 correctly. We believe that our bodies are designed to be in the anatomically correct position at all times. 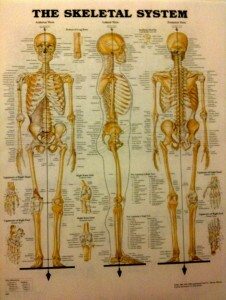 What we mean by this is that your skeletal system should always be in perfect alignment. If you have ever seen pictures in an anatomy book like this one and seen the skeletal system then you know it is designed to look a certain way. We try to simplify this and focus on what we consider to be your 4 main structural joints, your shoulders, hips, knees, and ankles. Each of these joints are designed to be vertically stacked on top of one another and directly across from one another on a horizontal plane as you can see in the picture. This is what is considered the anatomically correct position and is the way our bodies are intended to be. However, here is the catch. For us to be in this position means that our muscular system is working perfectly. There can be no imbalances in strength, size, or range of motion or the muscles will pull the skeleton out of its natural alignment. The skeleton is completely dependent on the muscles both for movement and positioning. For example, your iliopsoas (hip Flexors) are a pair muscles that originates in the hip and lumbar spine and then inserts down on your femur. These muscles are responsible for the flexion of the hip (lifting of your knee when running) and are just one of several very important muscle groups when it comes to running. Since we have used this example in the other laws lets again talk about sitting. If you spend a significant amount of time on a consistent basis in a seated position, your hip flexor muscles will become increasingly tight. What this actually means is that the muscles can “shorten” as the fibers become less pliable from their lack of being elongated with proper stretching and efficiency training. This in turn will literally begin to pull your pelvis forward or into an anterior tilt. One of the many negative side effects of this will be increased tension in your lumbar spine. The point in all of this is that if you are not doing the appropriate amount of stimulus to all of the muscles in the body, it will be impossible for your body to hold the anatomically correct position. So all 4 laws work together to form the Runwithpower training system. In the nearly two decades I have been training I have realized that the perfect training system already existed, we were just not following it. By us understanding that our bodies are designed to receive stimulus, that the greater amount of stimulus we give it will create higher levels of change, that we should receive stimulus in a progressive manner, and that everything we do should be to help our bodies maintain the anatomically correct position, we can give you the best possible running programs. We will do more posts later and in greater depth on the 4 laws but we hope that for now you all have a good idea of what forms the backbone of our training philosophy.